"The possible's slow fuse is lit by the imagination." 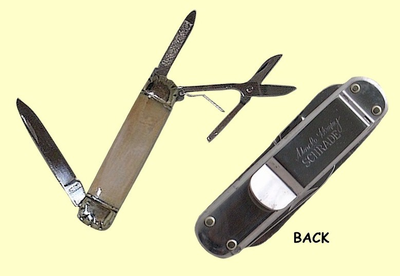 It's been so hard to find a really good folding knife with great scissors. Finally the Scrade (Uncle Henry) company has produced a fantastic new knife - Well-designed and executed with legendary Schrade quality and robustness! It sports a 2 inch pen blade, as well as a file! And, get this, It even has a sturdy scissors that actually work well! Try them on your nail, paper or yarn, and you'll be surprised at how efficient they are. This knife will need very little attention. 3 inches closed. A great gift for any pocket or purse, or, for that matter, any knitter's basket! We will gladly add your name or initials on the ivory side at no extra cost. Comes complete with felt carrying pouch.